Before the green racing flag can drop, surveyors map the route for an Indy race in downtown Baltimore, Maryland. The genesis of this project was the formation of Baltimore Racing Development, LLC (BRD) in 2007 to bring an Indy Racing League (IRL) event to Baltimore. News of the race formally broke two years later in August 2009 with an announcement that the City had given BRD exclusive rights to negotiate bringing the race to Baltimore for 2011. This announcement also set April 1, 2010 as the date for the City making a final determination about the race. That late summer announcement meant all engineering studies had to be complete by early the next spring. In order to expedite the project the City used its existing on-call engineering contract with McCormick Taylor, Inc. to design the race-course street reconstruction. While this saved time and brought a consultant they were familiar with into the project, it also introduced existing contract limits into the project. And it brought us into the project as part of the contract team. The parameters established for this project resulted in a mapping accuracy of 0.03’. Features normally mapped in a typical project, such as curbs, walks, trees, utility covers, and lane striping, were located. In addition, this mapping identified all surface features, including cracks, gaps and changes in elevation down to a less-than-one-inch threshold. As an example, typical mapping identifies the outer rims of manholes; for this project both the rims and covers were mapped, resulting in breaklines with less than an inch of separation. A number of shallow pavement cracks were mapped, resulting in three breaklines: two on the surface and one inside the crack. One-foot contours were also provided; however Virginia Resource Mapping provided a TIN file that Mercado Consultants used to create a detailed, complete DTM surface of the entire project area, roughly 2.5 miles of building-face-to-building-face mapping. McCormick Taylor was asked to prepare a final bid package to bring the proposed road course up to IRL racing standard. The course is more than two-miles long and includes Pratt Street, Light Street, Conway Street, Howard Street, Camden Street, Russell Street, Washington Boulevard, and Paca Street, all adjacent to the Inner Harbor, the most popular tourist area within the city. The final bid package had to be prepared and submitted by June 4, 2010 to allow enough time to complete construction before the race. This, of course, meant that Mercado Consultants, Inc. had to provide topographic mapping for the route even sooner to allow time for the engineers to complete their work. So, with that race announcement, the stage was set for a project schedule that sounded more like a reality television show motorcycle or car build-off than a design project. We received the request for proposal under this contract in mid-November 2009 with McCormick Taylor needing to have 90% of the plans ready by May 2010. Now we have the first two elements. The engineering had to be done quickly and it had to be done within the existing contract framework. It’s time for a reality-show-like segue with: But wait there’s more! The race cars require addressing all road-surface irregularities because they have only an inch of clearance, have limited suspension, and are going very, very fast. This is over inner-city streets filled with utility covers, storm drains, and a mix of battered concrete and asphalt pavement. This is where needing high-quality topographic mapping comes into play. The specifications we were given for mapping the streets called for showing breaklines along both sides of all seams, expansion joints, cracks, and utility covers with accuracy sufficient to show all irregularities that could affect race cars with a small amount of clearance. At this point in the meeting I will admit to suffering some degree of shock already, given where this was, what they needed, and when they needed it. But it got even better. Jim Dorsey PE, McCormick Taylor’s project manager who definitely has a land surveyor’s ironic sense of humor, explained that we would not be able to close the streets for the mapping. Then, as he waited for all that to sink in, he asked if I could have a proposal to him within a couple of days. Maybe it was shock, but my answer was “yes.” Why not? All they were asking us to do was map 2.5 miles of downtown Baltimore, showing every crack, seam, joint, and utility cover, without closing the streets in five months during winter with the possibility of losing days at a time to weather. As for saying “no,” this project came through an on-call engineering contract, so we were already contractually obligated to do it. The only real question was meeting the specifications and negotiating a price that would work with the contract limits. Fortunately, Jim Dorsey and I had already done several Baltimore projects together and have a very good working relationship. Jim knows we are a relatively small company but that we have tackled high-profile mapping jobs before. I do not, however, envy him for having to trust his schedule to another company and then wait while we worked on it. All I had to do at that point was figure out how to do it. We had recently had success scanning a runway project with similar specifications and a no-closure limitation. Therefore, my first thought was laser scanning. I spent literally two days on the telephone. But we are back to the fast, cheap, and good problem. No company that I contacted could absolutely promise all three. As soon as they discovered we were talking about the central business district, without doing street closures, and with the kind of detail needed, the schedule seemed to be the real issue. 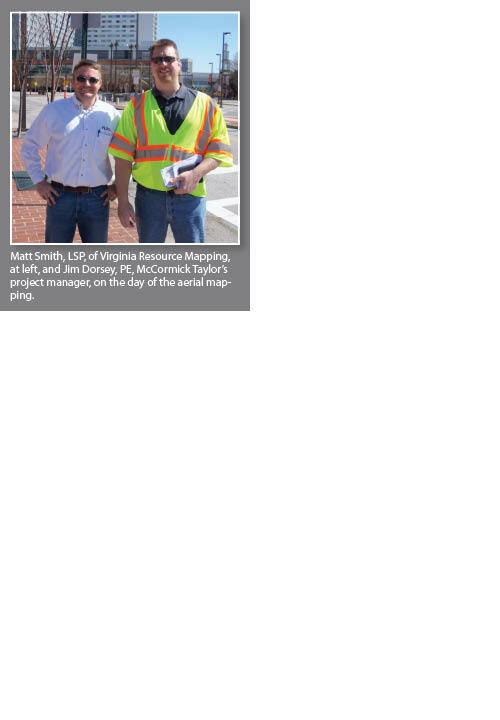 This is when a call for help went to Matt Smith, my old friend at Virginia Resource Mapping (VRM). Matt had come through for us on several other inner-city projects with tough deadlines and nearly impossible restrictions. That includes helping us provide aerial topography for the DC Nationals Stadium project while District of Columbia airspace was completely closed to mapping over-flights. Our nation’s capital is not the easiest city to work in. But that is another story. Matt immediately suggested low-altitude helicopter photography as being pretty much the only alternative. He told me that helicopter mapping would be a perfect way to get the kind of data I was looking for. While the thought of using some sort of lidar entered the discussion, be it mobile or low-level airborne, it was thought to be cost prohibitive and might still leave gaps in the data that would be time consuming to fill in. Matt said he had excellent results in the past using low-level photography for mapping projects on hard surfaces. For this project, he proposed using Richard Crouse & Associates (Frederick, MD) and their Bell JetRanger helicopter, equipped with a Leica RC30 precision aerial camera. Flying at 300’ above the ground, he expected to see accuracies within 0.03’. Matt outlined a plan to do short, rolling, road closures as the helicopter was doing the photography so the streets would be clear. Genius. All I had to do was sell it to Jim Dorsey. He immediately approved the mapping specifications. The sticking point was outlining a traffic-control plan and getting the city to agree to it all. As much as we would like to take the credit, Matt deserves it for working out a traffic-control plan that the city could live with and would give him the clear streets he needed. This was actually the most difficult part of our proposal to get the city to approve. While traffic control seems easy enough, it involved getting Baltimore City police, parking enforcement, and neighborhood representatives to agree to the plan. We were going to have to provide towing notices 48 hours in advance, have city tow trucks standing by to tow cars to adjoining streets on the morning of the flight, and have city police on hand for street closure enforcement as well as our own traffic-control company providing sign-board trucks. With our proposal approved in mid-December 2009, it is time for the next dramatic segue. There was an unexpected change in city administration with a new mayor not being sworn in until February 4, 2010. For us it was the classic hurry up and wait. The topography had to be finished by the end of April 2010, yet we went into March 2010 without a notice to proceed. As we watched the street trees start to bud we knew the project was fast becoming impossible. We finally received conditional notice to proceed on March 10 but were limited to doing the photography only on weekends due to the rolling road closures. And as luck would have it, the weather did not cooperate the first weekend and set us back another week. Since we were down to seven weeks to complete the mapping, we put all of our field personnel on the project despite the photography delay. The city surveyor asked that we incorporate all exiting city control monuments into our network and use city grid rather than state plane. Plus, we needed baselines for construction in place and we needed control for the field location work we knew was coming. Therefore, we were basically limited to a conventional traverse. We knew using all available city control would hurt our horizontal adjustment because the control monuments are of varying age and precision. But we were more concerned with vertical than horizontal accuracy and managed to get a reasonable StarNet adjustment that excluded only one control point. While the traverse was being run we had another crew running levels with a Leica digital level. Vertical accuracy was paramount for this project. Therefore, we did not want to introduce more error than absolutely necessary in the aerial targets or the points. We knew from experience that our digital level would be far more accurate than the existing city level network, so we made several level runs between city benchmarks and NGS benchmarks to determine a good starting benchmark and to set some QC checks. From that we ran a single continuous level network for this project. As we have become accustomed to using digital levels, our network closure was extremely good. We had a third crew doing supplemental field run topography under the one major overpass where we knew the aerial mapping would not provide coverage. We also began obtaining storm and sanitary sewer pipe inverts. We did this work using our own field crew personnel for traffic control. We do mostly highway work, and our crews are trained and equipped for this. As those of you who work in major cities know, opening manholes in city streets and sidewalks is dangerous and time-consuming work. It is a credit to our field crews that they did this work without incident, not to mention giving up several weekends to open manholes while downtown traffic was as minimal as it ever gets. By the time VRM was able to do the photography the next weekend, we had completed all of the control work and overpass topography. We were as ahead of the game as possible. The day had finally come for the flight. The sun was shining, with not a cloud in the sky. Many cars were still parked along the route, so they were promptly towed. Matt met with the traffic control group, gave each a map of where they needed to set up, and sent them on their way. We had four Baltimore City police cars to help with any last-minute changes. Communication with the helicopter was handled via cell phone text message. We didn’t have any major problems during the flight; however, the whole process took longer than expected. The officers proved to be a big help as some motorists didn’t want to cooperate. Matt said he was sure there were some concerned citizens in the buildings as they looked out the window and saw a helicopter at eye level. The whole project took about two hours. Having him on hand to communicate directly with the helicopter pilot and coordinate movement with the city police turned out to be the key. With photography done, our crews located picture points from photo markups provided by VRM. Ground targets had been ruled out early in the project due to heavy pedestrian traffic throughout the entire site as well as the area being the heart of Baltimore’s tourism. Due to the vertical accuracy requirements, we leveled through each target with a digital level rather than using a total station shot as might be used for conventional aerial mapping. We were looking for the aerial target accuracy to be equivalent to that of our control network. We performed a StarNet adjustment of all the target locations and levels and submitted our typical control report with detailed photographs of each target point to VRM. Throughout all of this McCormick Taylor did everything possible to help with the tight schedule. They agreed to have the project submitted in sections and to work with raw, unedited, aerial topography until we could complete our work. We would receive a section of digital mapping from VRM and submit the raw, digital mapping to McCormick Taylor for preliminary engineering while we were still doing field checks and field topography in obscured areas. As soon as a composite field and aerial 3D CADD file for a section was completed we would submit it. As mentioned above, McCormick Taylor had to have 90% plans finished by May 17, and we were still doing their base mapping in April. McCormick Taylor’s engineers and technicians would check the raw topography and surface model and send markups back to us wherever they needed more detail. We went back and forth like this repeatedly, yet we never had any issues coordinating the field or CADD work with them. It was truly a team effort. And we actually did make a “final” submittal of the completed topography on April 29, 2010 exactly on schedule. While this was not the end of the project due to route changes, we did meet our original submittal deadline, we came in on budget, and the mapping supported the design work. In hindsight, what made this project successful was the cooperation we received and the trust shown in us and our sub-consultant, Virginia Resource Mapping, by McCormick Taylor, Inc. and the City of Baltimore. We are a minority business enterprise in the city and, as such, we try very hard to represent that program in a positive manner. I believe we were successful. What: An Indy Racing League sanctioned car rally on 2.09 miles of city streets. An estimated 100,000 visitors are expected. The race was approved by the City of Baltimore and the Maryland Stadium Authority and officially announced on June 2, 2010. The announcement ceremony was attended by Governor O’Malley, Baltimore Mayor Rawlings-Blake, the IRL president, and notable Indy drivers Graham Rahal and Al Unser, Jr. The race is on, and we are very pleased to have helped make it happen. Tom Yoakum is the chief of surveys and an associate with Mercado Consultants, Inc., Ashton, Maryland, and is a licensed land surveyor in Maryland, Virginia, Washington, D.C., and South Carolina.